Thai Paradise is a seductive game from Playtech set in the Land of Smiles. This Thai Paradise features a gorgeous beach, with a tropical flower as the wild and scatter. Thai Paradise has lots of bonuses with a gamble feature, free games, a mystery scatter and re-triggered free spins for an incredibly rewarding stay. Read our full review below. It’s time to jet off to an exotic world of eastern promise. We’re off to Thai Paradise to enjoy a cool time on a beautiful beach. It's available to play for free here - just like the many other free slots games we have on the site. Thai Paradise from Playtech is a very pretty slot with chill-out images of the beach and ocean, where you can dip your toe into the world of free slots games or have a wager to see if you can win your way towards your own paradise island. It’s an idyllic world with a picture-postcard perfect beach for which Thailand is famous. The beautiful turquoise sea is in the background of Thai Paradise, with cool blue playing symbols in Thai script as well as a pretty girl, pink flower, elephant, boat and temple. Your first taste of Thai Paradise is of the beautiful girl standing on the beach. The flower is your wild and scatter, where you can win 10 free games with the chance to increase your winnings. If three or more flowers appear scattered, then you have the chance to increase your winnings, as they offer scatter payouts which are multiplied by your original stake. There's also a mystery scatter when one of the usual symbols is picked to be your scatter during the free spins. This offers payouts when it appears anywhere on the reels and can increase your total bet by up to 15 times. So you can enjoy big payouts during the free spins, and the other good news is that free spins can be repeatedly triggered without limits. The pretty girl with a flower in her hair will hand over 5,000 coins for all five, while the elephant gives 2,000. You can play for free or bet a maximum of $1 on some or all of the 15 paylines. Another way to increase your funds is in the gamble game. If you choose to gamble after a win, you can guess the colour of the next card out of the pack. Guess correctly and you can carry on gambling until you lose or reach the limit of 1,500 credits. A few of the symbols are animated to add spice to the game. The Thai girl presses her hands together in the traditional Thai greeting with her hair streaming in the wind. The white elephant raises his trunk and sprays water over himself to keep cool. The flower releases pollen with the words 'scatter' or 'wild' appearing across it, depending on which function it is carrying out. You can adjust the slot to play the way you want with the betting line to the left or right, sound on or off and turbo so you can play at the speed you want. 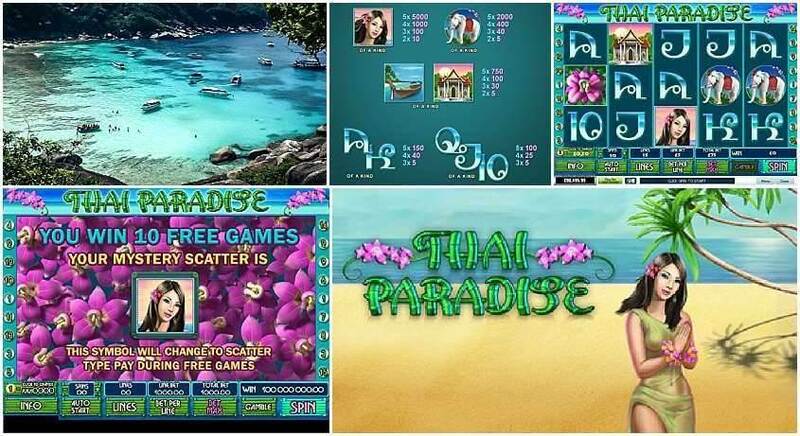 Thai Paradise is a simple slot to play with great images and background music. The highlight of this slot is the mystery scatter during the free spins round, which makes it a more exciting feature. You can also play it on your mobile and tablet to enjoy a taste of paradise. * Thai Paradise trademark / license is owned by Playtech. This site is not endorsed by Playtech.